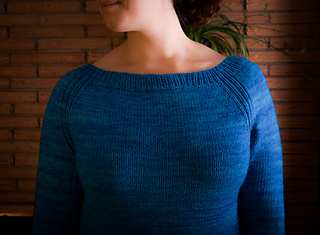 Crosshatch is a raglan pullover with a deep boat neckline. 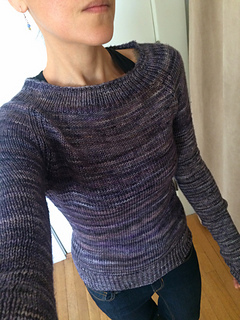 Worked from the top down, its fit is slim overall (minimal ease) with gentle waist shaping. Length is high-hip. 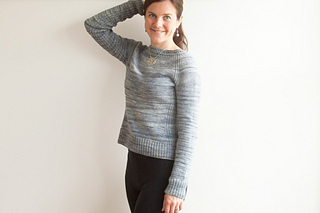 1x1 rib frames shaped stockinette on bodice and sleeves, trimming its hem and neckline, and extending along raglan armholes. 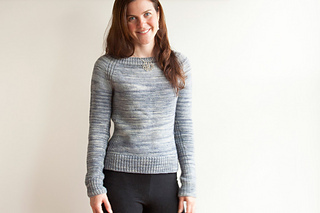 This same rib runs along nicely-long sleeves from underarm to cuff, enhancing their slim fit. These verticals remain uninterrupted as shaping is made on either side of (not including) these ribbed columns. Shown in Worsted by Malabrigo (pure merino wool; 210 yds per 100g skein); color – Polar Morn; 5, 5, 6, 6, 7, 7, 8 skeins or, for comparable yarn approx. 840, 925, 1025, 1125, 1225, 1325, 1420 yards. 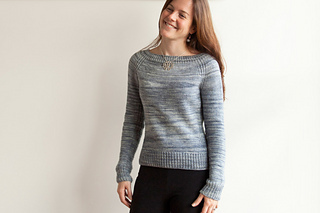 Knit, purl, k2tog, ssk, circular knitting, m1R, m1L, and knitted CO.
7 page pdf includes pattern instructions, photographs, schematics, a row tracking grid for managing at-the-same-time instructions, and definitions for relevant abbreviations.